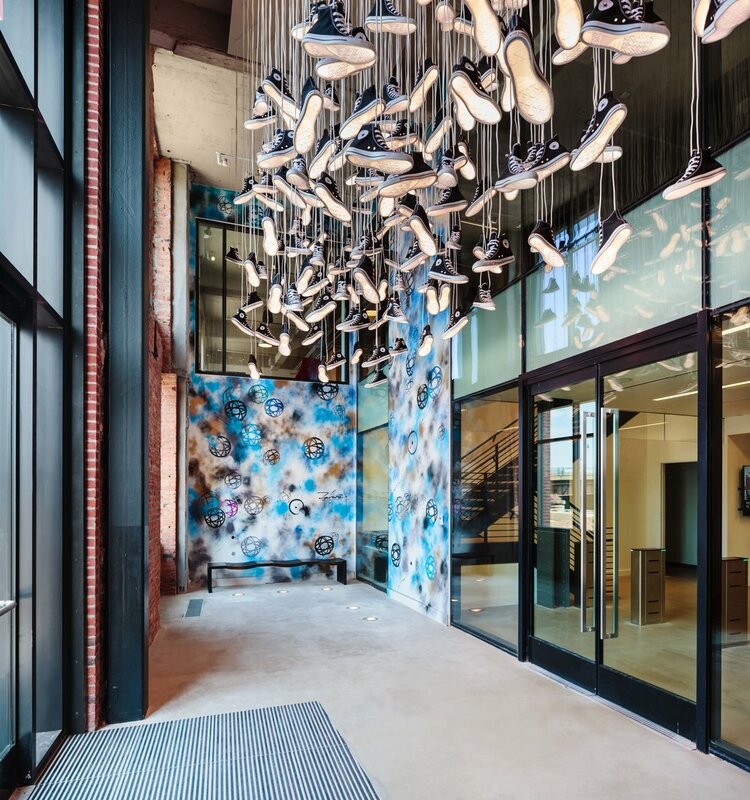 Our design for the world headquarters of this iconic shoe brand project created a dynamic new home for over 600 employees, as well as a fitness center, café commons, materials library, and flexible showrooms. Our work included the fit-out of all ten floors, as well as the design of a new pavilion building for retail and music recording. We were involved with the project from the very beginning, helping Converse vet many options before deciding on this waterfront site. A new steel and wood communicating stair winds through nine stories under a large scale skylight, bringing natural light deep into the building. We designed open and unassigned ‘pod’ meeting spaces looking onto the stair on each floor to encourage departments that were traditionally separated to meet up -- if the pods are full on your floor, you can easily spot an open one by looking along the stair. In addition to the interior work, we worked closely with developer Related Beal’s design team to completely renovate the existing 1908 building and add two new glass and steel stories, turning what was a dilapidated eyesore into a neighborhood draw.